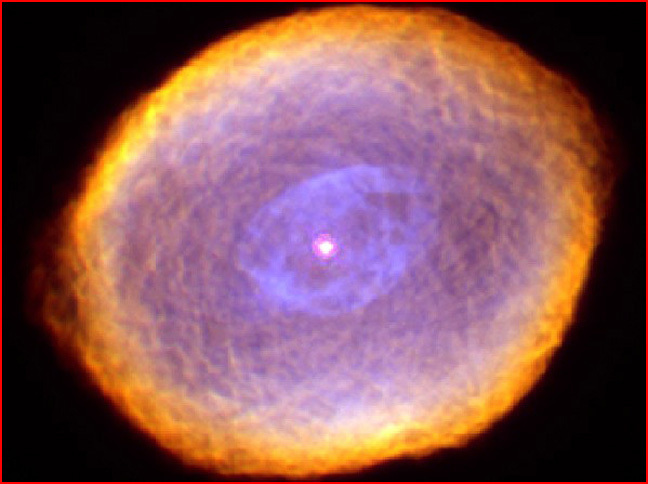 This cosmic egg (planetary nebula IC 418) is not the uniform spherical shell of gas blown off by a dying star that conventional theories expect. Both the shell and the inner "yolk" (blue) are stretched along an axis, and both are finely divided into cells that are surrounded by glowing filaments of matter. The central star varies in brightness over several hours, and conventional theorists speculate that it may generate "chaotic winds" that might somehow crisscross to create the cells and filaments. The Electric Universe sees a different egg. Shell and "yolk" are both composed of plasma, not of gas. The physics of electric currents apply, not the physics of winds. The shell is a plasma sheath, a "double layer" that acts like a capacitor, mediating the different electrical fields inside and outside the shell. Most of the voltage difference between the star and the surrounding galactic field is taken up in that thin, membrane-like double layer. The blue "yolk" is another, secondary, double layer that forms when the electric current feeding the central star reaches a threshold density. As is typical with sheaths, currents flow along the surface. And as is typical with plasma, the currents pinch into filaments that pull in material from surrounding spaces. The double layers and their current filaments also respond to the electromagnetic forces of the interstellar current filament feeding the system and are thus elongated along the axis of that current. That larger current flows in a circuit that threads through the galaxy. It is invisible because of its lower current density, but the magnetic field it produces is detectable in the squeezing and stretching of the egg that derives from it. That the power output of the central star varies over a few hours indicates that the power input is oscillating. Some feedback mechanism in the supply circuit has reached a resonant condition. That element of the circuit need not be in the star or nebula but could be far away, just as the circuit elements in a radio that generate the oscillating radio wave may be far removed from the antenna that radiates the energies.